When driving on a road marked with lane lines, you must keep your vehicle entirely within a lane. 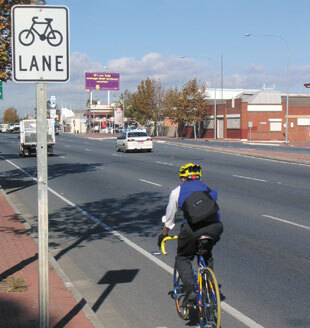 It is an offence to straddle a lane line except when passing a bicycle rider to give them the required room. give a change of direction signal, giving sufficient warning to other road users before changing lanes. On a multi-lane road, you must not cross or drive on a continuous white lane line, except to avoid an obstruction, or, to allow the required room to safely overtake a bicycle rider. This does not apply to the lines separating bus lanes or bicycle lanes, or the lines separating a road from a road-related area such as a parking bay. 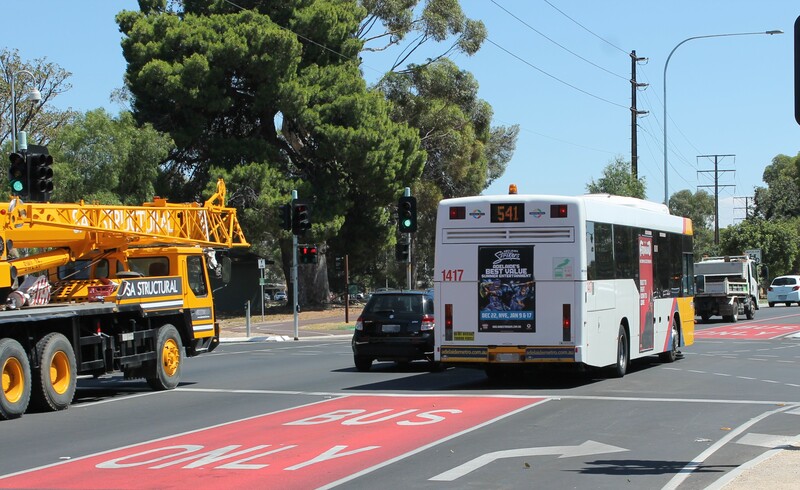 A bus lane is a lane denoted by signs, which is for the exclusive use of buses, emergency vehicles, bicycle riders and taxi drivers during the times stated in the signs. If there are no times stated it applies at all times. In each case the maximum distance you may drive in the bus lane is 100 metres. Only public buses or emergency vehicles can use a "Bus Only" lane. Bus Only Lanes are painted red, or marked with red lane lines, and have "Bus Only" in white letters. Heavy penalties can apply to non-authorised vehicles travelling in Bus Only Lanes. Bus Only lanes start with the road painted with a red box with the words "Bus Only" in white. This is repeated every 200 metres. 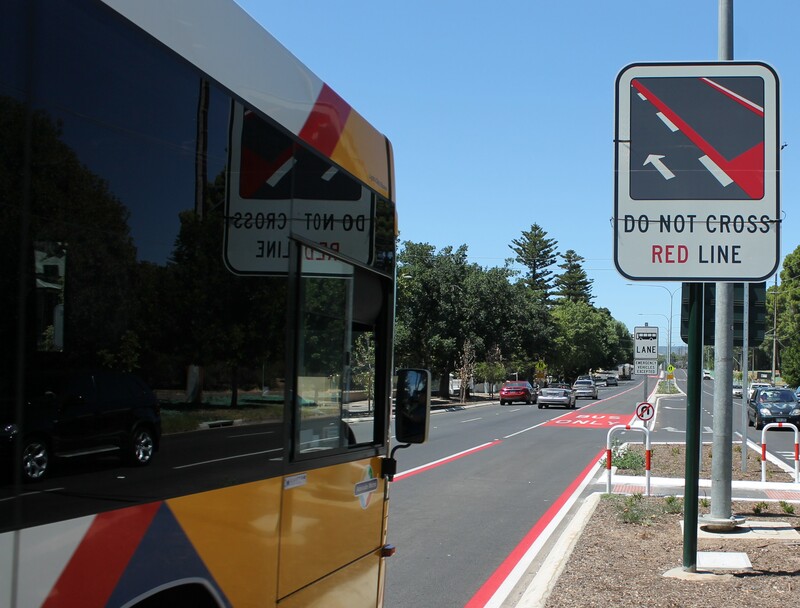 Between the red "Bus Only" boxes a "Bus Only" lane will be shown as a continuous red line alongside the white lane line marking. Only a public bus, or emergency vehicle can travel in a Bus Only Lane. The Bus Only Lane document (PDF, 2209 KB) has more information about Bus Only Lanes. A bicycle lane is a lane indicated by a bicycle lane sign and lane line for the exclusive use of bicycle riders during the times stated on the signs. If there are no times stated, it applies at all times. Bicycle Lanes may be coloured green where there is a greater potential for conflict between motor vehicles and bicycles. In each case the maximum distance you may drive in the bicycle lane is 50 metres providing you indicate and give way to bicycle riders. The maximum distance you may drive across an edge line to enter or leave or overtake on the left of a vehicle intending to turn right is 100 metres. You must not reverse unless it is safe to do so. You must not reverse any further than necessary. always look in the direction you are intending to reverse before beginning to move and continue looking in that direction while reversing, with occasional brief checks in all other directions. Use direct vision whenever possible - only use mirrors when direct vision is not possible. You must not ride or drive on a footpath except to enter or leave, by the shortest practicable route, adjacent property or a road-related area. When crossing a road-related area to enter or leave a road you must give way to any vehicle on the road, any pedestrian on the road and any other vehicle ahead of the driver's vehicle or approaching from the left or right. Watch out for bicycle riders riding on footpaths. You cannot drive on a traffic island or median. You must drive to the left of a median strip unless you are entering or leaving a median strip parking area or you are required to drive to the right of the median strip by a keep right sign. to enter an area in the dividing strip where parking is permitted. but only if it is safe to do so and you have a clear view of the road. to enter a turning lane that begins at the end of the painted island.